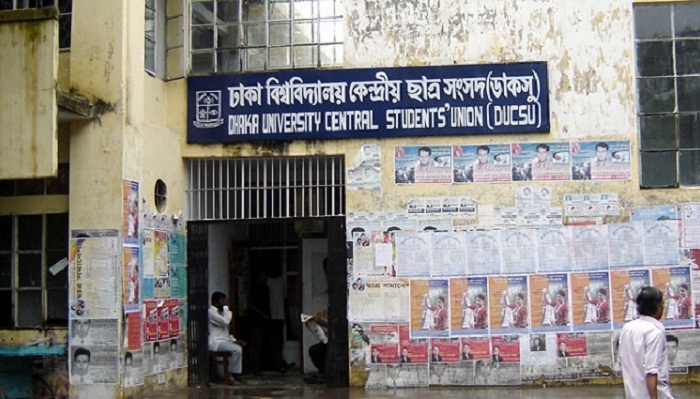 Different student organisations have expressed their mixed reaction over Wednesday’s High Court verdict asking the Dhaka University (DU) authorities for holding the Dhaka University Central Student’s Union (DUCSU) elections within six months. The HC bench of Justice Syed Muhammad Dastagir Hussain and Md Ataur Rahman Khan passed the order following a writ petition filed by 25 students of the university on March 21, 2012. Bangladesh Chhatra League (BCL), the student wing of ruling Awami League, welcomed the verdict assuring the DU authorities of its all-out support to them in holding the polls in a peaceful manner. DU BCL president Abid Al Hasan told the daily sun that they had welcomed the HC verdict. “We are hopeful that the DU authorities would materialise our dream into reality,” he said, adding that DU BCL would assist the university authorities in holding the student union polls on time with due enthusiasm and festivity. But, pro-BNP Jatiyatabadi Chhatra Dal (JCD) expressed skepticism over holding of DUCSU polls within six months of pronouncement of the verdict. Contacted, DU JCD secretary Basar Siddique told the daily Sun that they have doubt over holding the student union polls on time. He said that holding of DUCSU polls totally depends on the interest of the pro-government BCL. “However, we shall take part in the election, if it is held at all,” Basar said. DU Samajtantrik Chhatra Front president Romman Habib Suman told the daily sun that they had already appreciated the HC verdict, but they are doubtful over timely holding of DUCSU polls. “On previous occasions, DUCSU election was not held despite Chancellor’s instruction,” he informed. “Anyway, being a progressive party, we shall participate in DUCSU polls if it is held in near future,” he mentioned. A section of DU students opined that the issue of DUCSU polls would be lost into oblivion after several days. This is because, it will lose its appeal centering the upcoming 11th parliament election, they feared. They also identified the students’ wings of the political organisations as the main barrier to DUCSU polls. They have suggested to the DU authorities to hold talks with the student wings of the political organisations for peaceful holding of the student union polls. At that time he also said that the Chancellor of Dhaka University, President Abdul Hamid, had given an instruction to hold DUCSU polls immediately. “If we cannot do this even after his instruction, it will definitely tarnish the image of the university, which is undesirable,” he said. After fall of Ershad regime in 1990, no DUCSU elections were held although eight vice-chancellors performed their duties during the period.